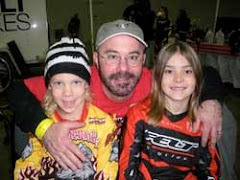 This weekend we are supposed to be headed to Pelham, Alabama to race regionals at Oak Mountain BMX. It's what we've done, or attempted to do, on this same weekend for the past four years. June of 2006 was our first visit to Oak Mountain. This was going to be William's first out of town race, and he was very excited. It was sunny and extremely hot when we arrived for Friday afternoon practice. William took two laps and returned to us complaining of a headache. I gave him some gatorade and told him to get back out there and practice. He returned once more saying he couldn't ride because of his head. It was so darn hot out there that I had no clue he was roasting with fever. We decided to load up and drive down to Montgomery so William could rest at his grandparents. When Vann went to start the truck, the battery was dead. Cell phone service is next to nil in the park, but we managed to get a garbled call out to my dad who came to our rescue. By the time we made it down to Montgomery, I knew something was bad wrong with William. I took him to the nearest emergency walk-in clinic, where he was diagnosed with mycoplasma, a form of pneumonia that kept him sick for two weeks. On a side note, while checking out at the clinic, William, delirious with fever and pointing at the receptionist, asks loudly, "Mommy, why does that lady have gold teeth?" I met the receptionist's eye, and sure enough she had enough gold teeth to retire on. If I saw her today, I would hand her a pair of pliers and advise her to head to the nearest cash for gold establishment. Our brief visit to Oak Mountain did allow me to see what a beautiful area it is. In early 2007, knowing we would be going to the Oak Mountain regional once more, I secured a cabin on the lake in the state park so that we could not only race, but fish, swim and grill too. It wasn't long after that William had his accident, and I gave our highly prized cabin reservation to friends. We didn't think track conditions could get much worse, until we arrived at Oak Mountain in June of 2009 in a torrential downpour. All of the faithful, determined to race, waited for the sun to dry off the track. Meanwhile, restless kids (mine especially) ran through the muddy woods wearing their only team jerseys. Wyatt has a way of getting extra dirty, and when Saturday's race was postponed until Sunday, I was forced to wash his racing clothes in the hotel bathtub. Racing finally began Sunday morning on a muddy track. Everyone at Oak Mountain BMX deserves to be commended for actually pulling off the race. It was obvious that more rain was on the way, so the race was run as quickly as possible. 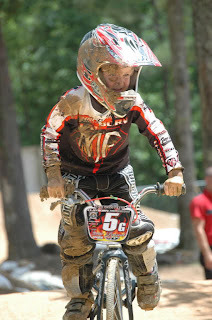 William raced cruiser that day, and was bumped up to the 9-10 class because of the lack of 8 and under riders. 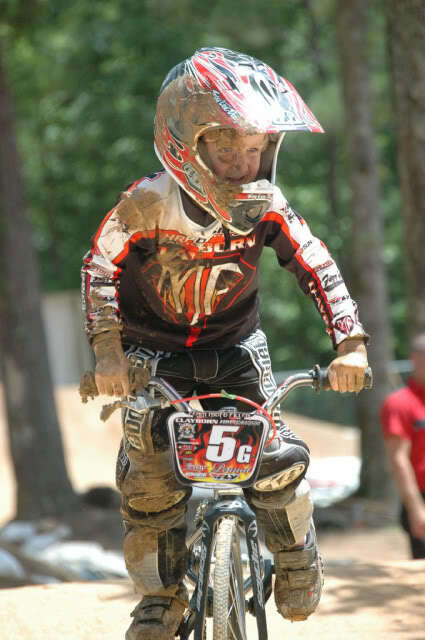 He was up against some fast kids, and was coming in a close third in every moto. Before he went up for the main, he told us he felt he could take second, and was going to go for it. Well go for it he did, and he folded up like a two dollar suitcase shooting out of the first turn, crashing hard in front of my 80-year-old aunt who had braved the foul weather to watch him race. It was no doubt a nasty spill, and the paramedics rushed out to have a look at him. Thankfully, he was able get on his bike and ride out. My aunt, bless her heart, fretted over William, who, although bleeding through his jersey, continued to insist he was fine. I think she was shocked that I actually let my kids participate in such a sport. Once Wyatt's main was complete, we were in a rush to pack up and go. Rain was clearly coming. The downpour began once more as I gathered trophies and tried to avoid slipping on mud. On the way home we made a unanimous decision, Oak Mountain is jinxed for us and we're not going back. This has absolutely no reflection on the wonderful people there. It's truly a fantastic facility, and I hope the jinx has ended. In our absence, I have no doubt that the weather will be perfect and the race will run without a hitch. To all of our friends racing in Oak Mountain this weekend, stay dry!